This solidly built 76000 BTU cabinet-style infrared burner grill from Fire Magic, the Aurora 530, features two individually adjustable heating zones, a 16000 BTU back burner should you want a rotissierie added on, and a 15000 BTU side burner built into the end table. If you want a machine with perks, the Aurora has plenty. The Aurora combines advanced ceramic infrared heating and lifetime warranty (original owner only) on cabinet and burners, with an assortment of well-designed extra features -- from condiment holders and locking caster wheels to digital thermometer/probes and electronic ignition. A nice car has plenty of little extras, and so should a nice grill. The hood, which is one of the components most prone to damage, is heavy stainless steel and double walled, with a rain resistant clamshell design that keeps out reasonable amounts of unexpected bad weather. If you like the taste of charcoal grilled meat, a charcoal basket is available as an accessory -- place it under the cooking grid and over the burners to convert a portion of the cooking zone to the traditional grilling fuel. Fire Magic also offers a cradle rotissierie which allows cooking by rotation without skewering the meat, for easier serving. Although the ceramic infrared system is not as efficient as TEC's two stage engineering, Fire Magic's Aurora 530 is solidly built and backed by an exceptional warranty. 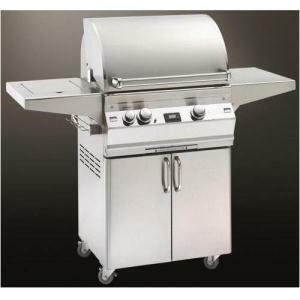 The numerous extras add convenience to an already outstanding grill.